Rev. 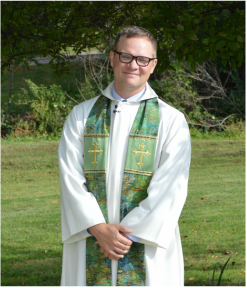 Jared Hamilton (United Church of Christ) has served the United Church of Hinesburg since 2013. As pastor, Jared works in this vibrant faith community, advocating a faith of exploration, mutual support, inclusion, and works of justice. Ministering to a multi-generational community, Jared's work includes youth group and coordinating yearly youth trips, communion education classes, adult faith formation groups, pastoral visitation, and leading a community worship. Jared received his Master of Divinity from Andover Newton Theological Seminary in 2012. He has served as a chaplain at New England Baptist Hospital and on staff at Human & Civil Rights Organizations of America. He is a member of the Society of Biblical Literature and the Next Generation Leadership Initiative of the United Church of Christ. Jared gardens and keeps bees. He is married to Leah Hamilton and spends his down time with their three young children, Camille, Simon and Miles.